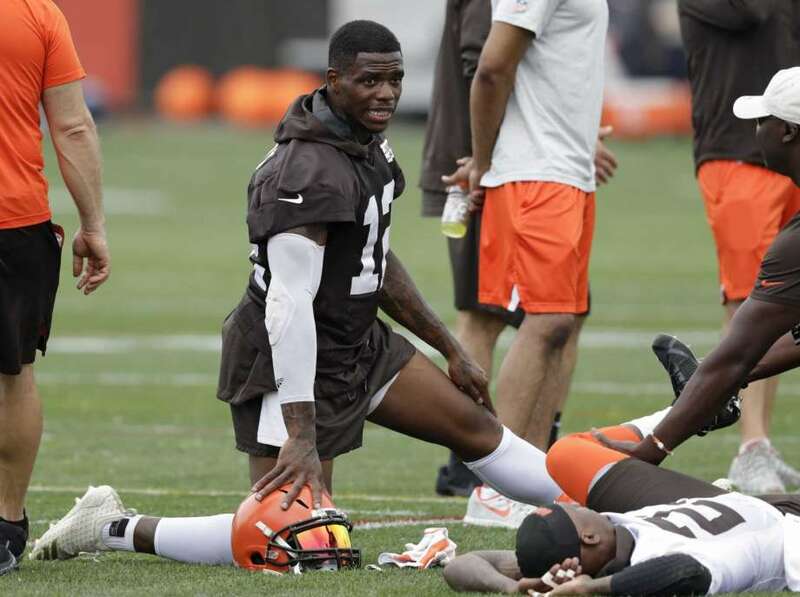 Proper stretching is crucial for preventing soft tissue injuries, as this spring minicamp shot of the now-absent Josh Gordon shows. We have crossed that fulcrum of the NFL year when accession turns more toward attrition. The raft of draftees and nearly all of the FA signings and trade acquisitions are already on board the 90-man roster. Things look flush. Optimism runs rapidly through fans’ hearts. The depth chart does seem rather deep! We’re already past that stage in time. Camp is in full gear. Players are playing, competing for their pro livelihoods. Fourteen straight weekends of Browns football games kicks off this Thursday. The reality of injuries has already manifested with some frequency — not quite megahurts, but still some measure of frequency. Since the apparent bounty of Dorsey acquisitions, plus a dozenish draftees still under cheap rookie deals, here are those whose status is or has been less than available already. Overall, a list this long and illustrious is not atypical in either direction for early August. But it is sobering, no? that an outsized factor — injury — implies not only physical damage but also degrees of disability capriciously affecting teams, seasons and games, and careers and lives too. Brace yourselves then. We shall hope for good health as always, but especially now as this dynamic roster swirls into stronger, sharper formations. Not that the possibility of accession is entirely over. There are always street free agents, trades, and especially waiver claims to be made. The Browns top the waiver claim priority list through Week 3 at least. Scrutiny there seems more constructive than anything beyond kicking Dez Bryant‘s tires. This entry was posted in the team today on August 7, 2018 by Dave Algase.